Mechanics: The car has no mechanical problems. The engine has good compression and neither burns nor leaks oil. The transmission was overhauled in 2010. It has manual overdrive. It cruises at 60-65 mph. The clutch master and slave cylinders have recently been replaced. The brakes are sound. All the suspension and steering bushings were replaced with IPD synthetic bushings two years ago. The stock shocks were replaced by Bilsteins. The ride is a little stiffer but not obnoxiously so. The steering is tight. The car has been converted to electronic ignition. The exhaust is stock. The car drives and handles well for a basically stock 1968 Volvo. The tires are Michelins at about 70%. The battery is new. Cosmetics: The car was repainted two years ago to the original color, which Volvo calls yellow, but is closer to beige with some yellow in it. The body had/has no rust, no dents, and little in the way of dings. It looks beautiful. The stainless steel trim shows some scratches and discoloration as do the bumpers. The grill must have been replaced somewhere along the line because it is like new. The glass is all good. The windshield and gasket have been replaced. 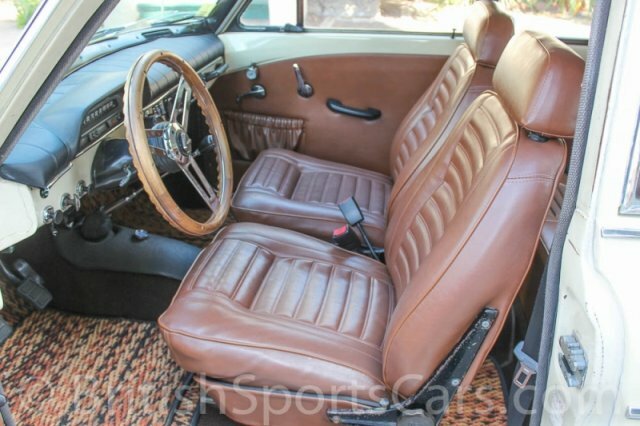 The dark tan interior is excellent. The front seats have been recovered. The rear seat is original and has cracks along the top near the rear window. The dash area has been somewhat modified. The ashtray has been removed and an oil pressure gauge and amp gauge are in its place. The cigarette lighter was removed and wires have been run through that hole, and an RPM gauge is mounted on a piece of black PVC which is pointed at the driver. The owner disliked the glove/junk tray, so he removed it and put in a slender box which fits under the passenger seat. The original Volvo seat belts have been replaced by more modern three-point belts that retract. The original steering wheel has been replaced with a wooden steering wheel. The original steering wheel was the later model, the same as on the 140 series; the original steering wheel comes with the car. All the original parts, plus many extras, have been saved and come with the car, including a push button AM/FM radio. Also Included: The car comes with a briefcase holding receipts, instructions, history, etc. about four inches thick and dating back to 1993. Also, there are a number of manuals and parts books.